How Does Eurozone GDP Figures Impact EURUSD? When will the Eurozone Prelim flash GDP figures be released and how does it affect the EURUSD pair? January 31, GKFX – At 10:00 GMT, the first reading of the Eurozone fourth-quarter GDP figures will be reported. The consensus amongst traders expects the bloc’s economic growth to steady at 0.2% inter-quarter in Q4, while on an annualized basis, is expected to decelerate to 1.2% versus 1.6% booked last. Readers can find FX Street's proprietary deviation impact map of the event below. 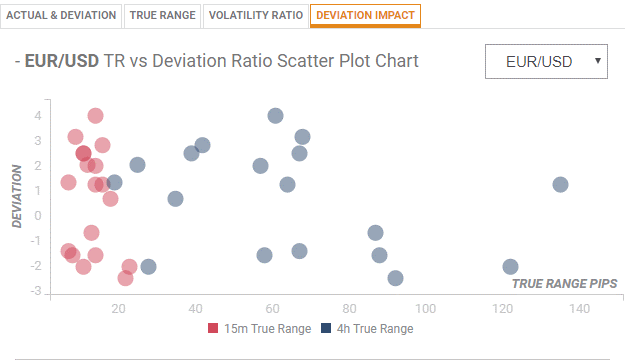 As observed the reaction is likely to remain confined between 10 and 70 pips in deviations up to 4 to -2.5, although in some cases, if notable enough, a deviation can fuel movements of up to 120-130 pips. From a technical perspective, an upside surprise in the Eurozone GDP figures could add extra legs to the EURUSD upside, fuelling a break above the January 11th high at 1.1542. A sustained move above the last could open doors for a test of 1.1563/72 (200-DMA/ multi-month tops) and 1.1600 (round number). On the flip side, a bigger-than-expected drop in the annualized reading could drag the spot back to 1.1465/54 (daily pivot/ 5-DMA), below which the next supports are aligned at 1.1428 (20-DMA) and 1.1405 (10-DMA).